Operation East Wind 8 dates and location have been set. 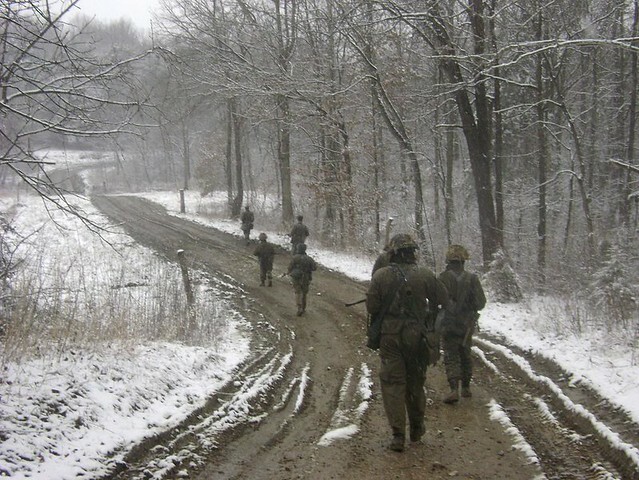 What: Operation East Wind is a 9 day long 24 hour per day immersive milsim event set in the closing days of the Cold War. From the moment you arrive till the moment you leave, you are surrounded by and living in the life of a soldier deployed on an alert in the Cold War. You may choose to be part of either the NATO forces or the Warsaw Pact with each side having it's own specific options, requirements, advantages, and disadvantages. At East Wind, you are involved 24 hours a day for the entirety of the event. 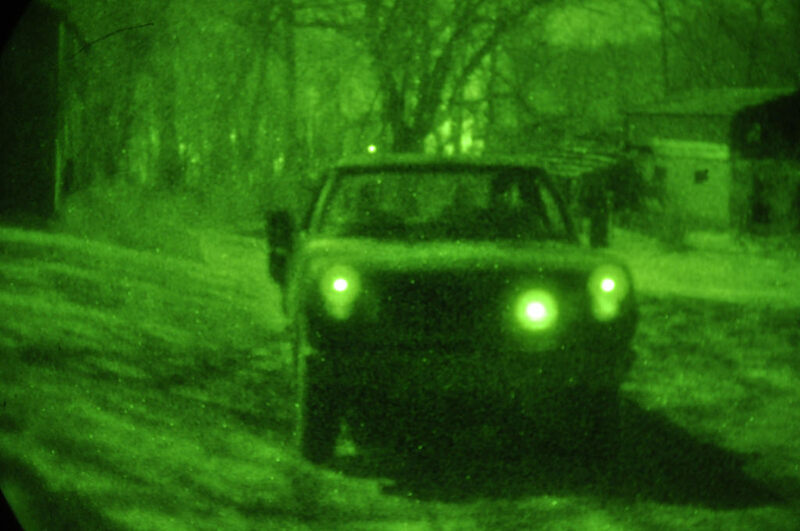 You will know the feeling of walking out on a multi day patrol, the sound of a truck sneaking through the night to pick you up after a long hard mission (if you are lucky) and the sights and sounds of dark forest seemingly teeming with the enemy around your little patrol base in the black of night. You will use night vision, you will use mines, you will ride in military trucks and armored personnel carriers, you will be supported by armor and you will use period correct comms equipment. You will know the boredom of a 03:00 TOC shift and the sinking feeling in your stomach when that shift suddenly STOPS being boring. You will know the true value of a hot drink on a cold rainy day. You will know how lonely the world can be when your little outpost is under attack and you know that the nearest help is way too far away. You will know how piercingly bright a parachute flare is on a moonless night. You will know the smell of a canvas tent on a sunny day. You will know how nice and cozy a stove is on a cold wet day. 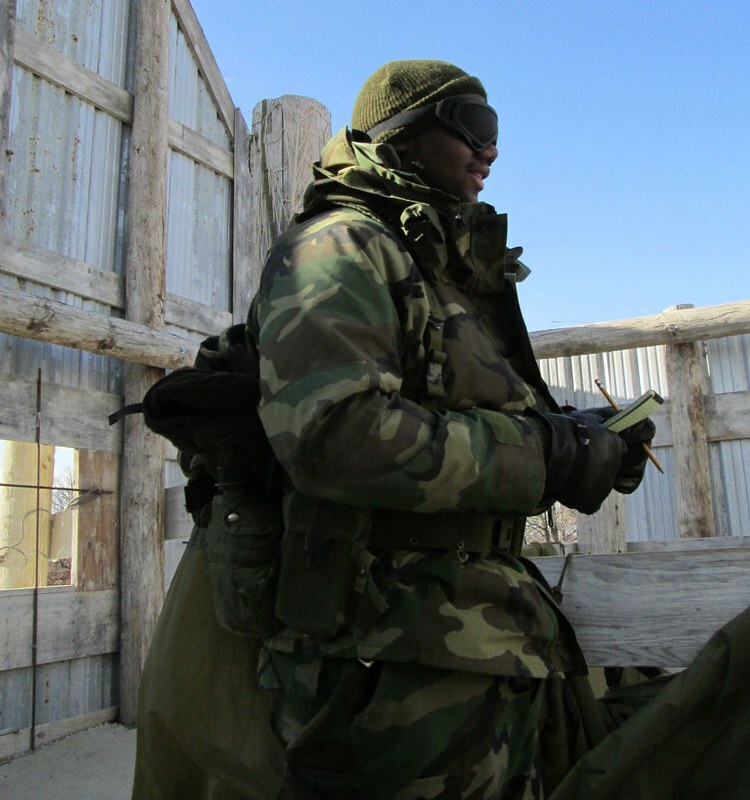 You will know what it is like to transition from peacetime, to alert, to war. Attendees must be 18 years of age or older unless they are a prior event attendee who is pre-approved by event administration. days is $165. For those attending from 5-9 total days the cost is $200. 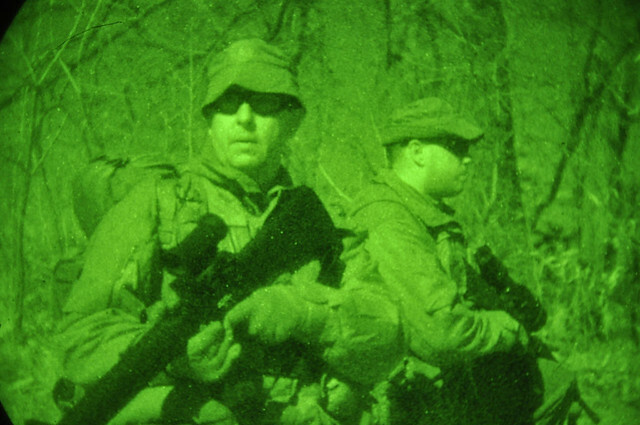 All attendees are allowed to check mission equipment out from the supply tents including correct night vision systems, flares, IR systems, Claymore and POMZ mines, radios, telephone systems etc. Sign up is now open and will close on Feb 1st, 2015. At signup, a non-refundable deposit of $50 is required with the balance due on Feb 1st 2015. Where is East Wind 8 being held? We are proud to announce that East Wind 8 will again be held at D-Day Adventure Park in Wyandotte, Oklahoma. No doubt, there are a great many of you who have played at D-Day before. It is an amazing facility with a lot of really impressive infrastructure. You might be tempted to think that you even know the D-Day Adventure Park pretty well... You will be quite surprised to see how much more there is to that property than you ever imagined. We will be operating on a 1000+ acre playing field with 45 miles of roads and trails. There are towns, an airfield, steep hills, green valleys, streams, ponds, and lots upon lots of space. If you have played at OK D-Day before you have probably seen a little bit of it but I assure you, it's just the tip of the iceberg. We run East Wind events for 9 days because in order to put together a quality event there is a certain minimum amount of time it takes to get everything all set up and settled in. If this was a weekend event, we would spend all day and night Saturday setting up and getting everyone settled in and then all day Sunday endexing. By running for 9 days we maximize our field time and get the most value out of our week's vacation time (or spring break for you guys in school). If you cannot attend for the entire time, that's fine; you can attend for as much or as little as you can fit into your schedule. Why this degree of insanity/attention to detail? Sure, we could camp in civvy tents instead of GP Mediums or real Soviet tents. We could use a Ford Tempo with a plywood turret instead of a real Diamler Ferret. We could move guys around in a short bed Chevy pickup instead of a M35A2. Where would the fun be in all of that? At East Wind we seek to get everything right down to the smallest detail because this is how we immerse you into the event. You do not attend East Wind, you are part of it, you are inside the world that we create for you, you can 'feel' this event. Why should you choose to go to East Wind 8? This one is easy. Since the inception of this event our motto has been 'Not because it is easy, but because it is hard.' You should be going to East Wind because you are looking for a challenge, an experience. If you are looking at the full experience, you should be going to East Wind because you are ready to live an event 24/7. You should be going to East Wind because you have asked yourself, "Is East Wind right for me?" and said yes. Why should you NOT go to East Wind? This event is not easy, we don't want it to be easy and if you are coming then you should not want it to be easy either. We say this not to pass judgment on those who should not attend but to allow everyone out there to pass judgment on East Wind and decide if what we are doing fits with what you, yourself, want to do. What do I need to know to be successful at East Wind events? 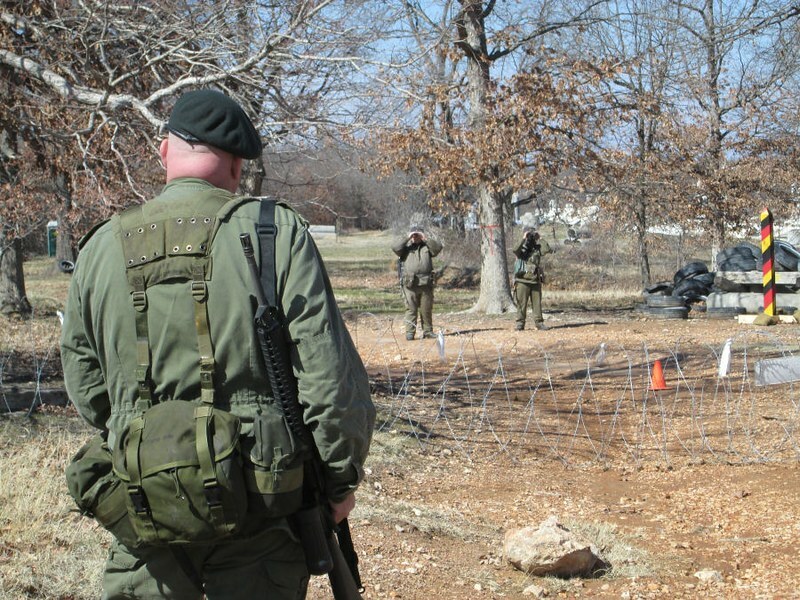 East Wind offers challenges unrelated to most airsoft events. It naturally goes without saying that knowing a little bit about airsoft helps but far beyond that remember that you are living in the field and actually doing a lot more field craft type work at East Wind than you are likely to encounter at an average game. You will likely find yourself adapting a lot better if you spend some time out in the woods in inclement weather since East Wind stays tactical regardless of weather conditions. knowledge of your equipment goes a very long way as well since you will be living and working in it 24 hour a day for 9 days. Obviously, there are a variety of technical skills that are helpful to know as well which is why we run training events monthly covering a variety of skills that will make your East Wind experience more enjoyable as well as provide an online library of training materials in order to assist you or your group in training up for the event. Apart from that, the most important thing you need to know to be successful and have a good time at East Wind is how mentally tough you are. If you are willing to give something 105% and not quit, this is the event for you. It will blow your socks off and you will love every minute of it. East Wind isn't just for those in the US either. For several years now, we have had people join the East Wind community from outside of the US with an ever growing team heading down from Canada and players even coming across from Europe to take part in the experience. It's probably not as difficult as you'd think and the community will try to assist where at all possible to ensure that those coming from afar can do so as smoothly as possible. If you have any worries or concerns, we should be able to answer all of your questions about coming to the US for East Wind, after all we've got attendees who have done it and can offer you the advice and assistance you need to make it happen. English fluency is not a requirement. We are an event set in Europe, working with different languages is part of what we do already. Pictures speak a thousand words so here are a few photos from past East Wind events to give you guys an idea what we do out at East Wind. UK Infantry moves out with a FV-701 Ferret armored car on patrol. One US squad holds a key intersection they will be passing through, another US squad has their right of line once they begin moving towards contact, a US M114 armored scout will accompany the Ferret as they screen ahead, while a West German unit stands ready to react if they hit contact they cannot handle. Missions are in depth, planned well, and long duration. 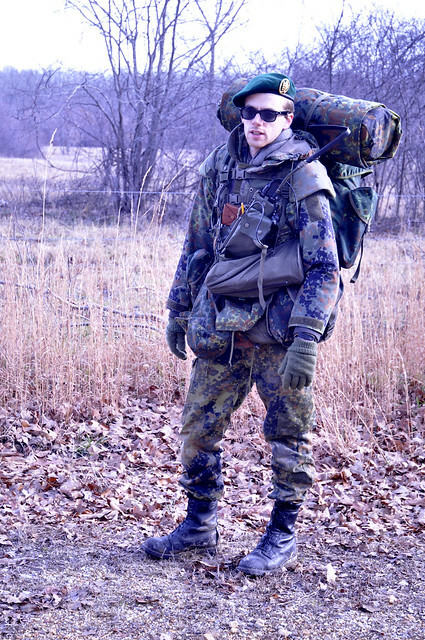 A West German Jager light infantryman prepares to step off at an East Wind training event. 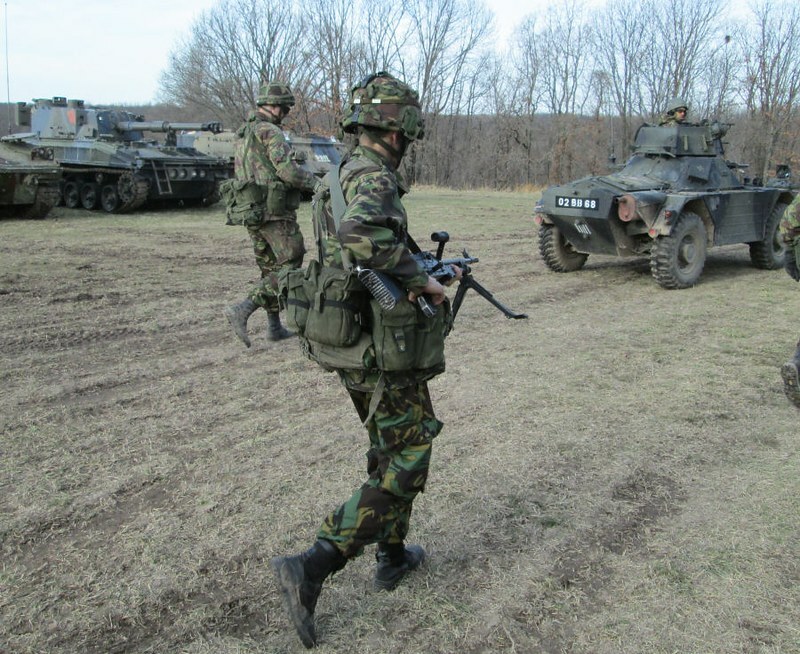 He's carrying not only his ruck with the gear to sustain him for the next 24 hours at this winter event but also a SEM-52a radio (slung across his chest) and a Zeiss Orion 80-1 night vision unit (slung below the radio). 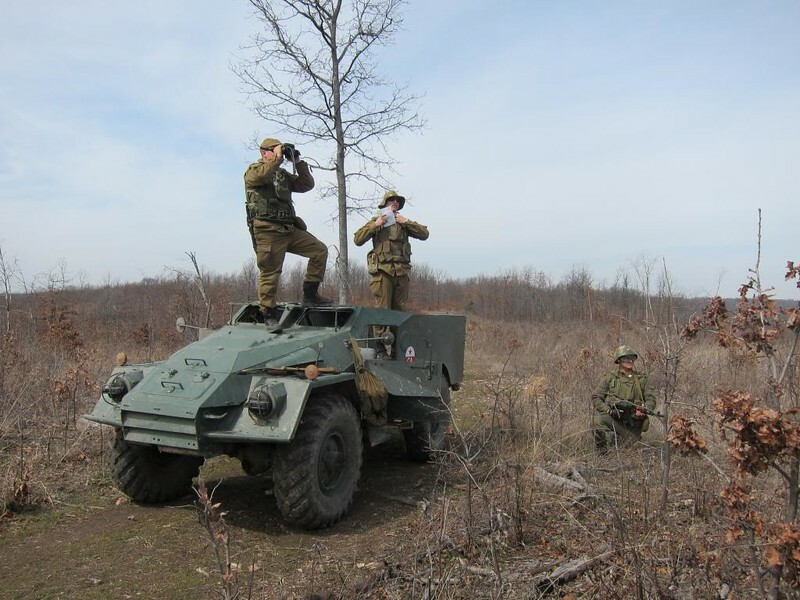 Soviet motor recon troops make use of their BTR-40 to scan NATO rear areas on an offensive recon patrol. The area they are overlooking is a 210 acre valley that is the primary infiltration route for NATO troops heading towards the border. Figuring out the routes being used is the first step in being able to take action to disrupt NATO activities in the border region. 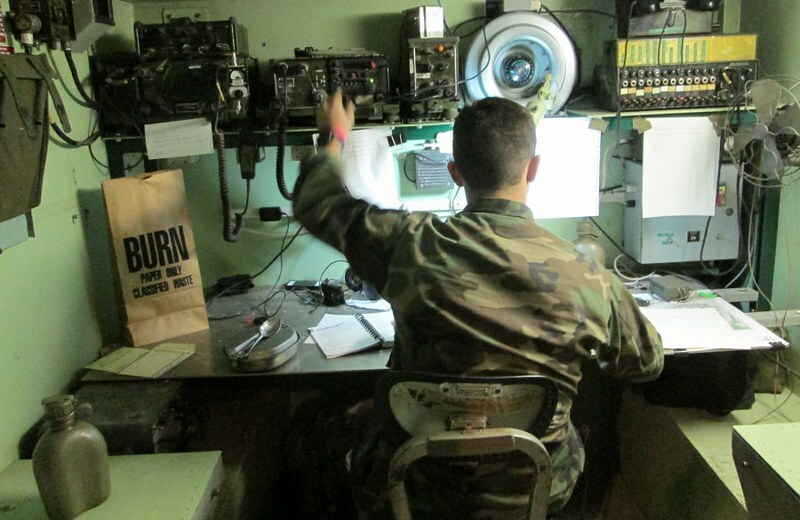 A US squad leader on duty in the TOC managing incoming radio traffic using period correct US comms gear. He has his notepad out and is copying traffic as it comes in. Once the message is copied, he'll decrypt it using the SOI cards hanging in front of him then either reply or take action as needed. This link takes you to a vid of Soviet troops using their R-159 radio to call their allies the East Germans after a successful assault to take a town. Notice how the guy has a hard time with the map? That's because the maps are not garden variety generic maps, they are exact replicas of the proper Soviet pattern maps and are different than the US maps he worked with in his US Army service. Soviet and East German troops load up in a pair of UAZ-469 utility vehicles for trip forward. These little trucks are the workhorses of the Warsaw Pact motor pool delivering troops and supplies 24/7 regardless of weather. 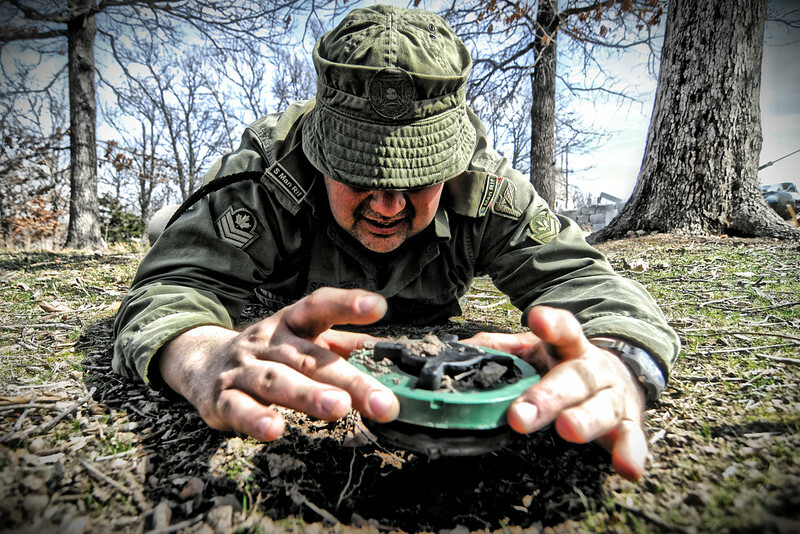 A Canadian Forces soldier carefully removes a PNM-2 mine (Made from a Madbull Powdershot mine) from a section of the border. The night before, his unit discovered this Warsaw Pact minefield the hard way, now they are back to get these things cleared out so that nobody else has to learn the same lesson. You can see that he has carefully cleared out around the mine and probed under it to try to mitigate the risk of anti-handling devices. This is nerve racking work. A small section of Soviet HQ troops man a radio retranmit station which provides a critical link between troops operating in a distant valley and the HQ. Not every mission is door kicking exciting, some of them are routine, all are important and none are being done without a reason. There's no collecting rubber chickens, no patrolling down a set route so the enemy can ambush you, no scripted battles. If you are sent to do something it is because it is important. These troops know this mission is important, that is why they are here doing it. The last thing they want right now is "trigger time" but if it comes you can bet that they will fight very hard to keep this station on the air. 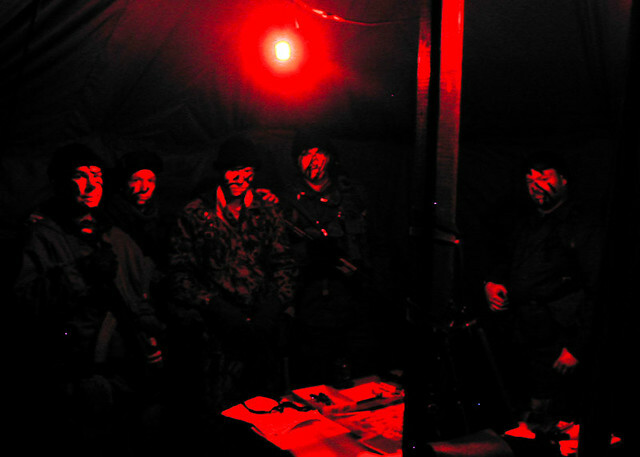 A Soviet patrol prepares to move out on a night recon mission. East Wind runs 24 hours a day. A Soviet soldier looks out into the failing light of the day from the ruined building his section holds. He fought hard for the town he's in right now and he's got a long night ahead of him making sure he keeps it. He know's NATO will come tonight, he know's there will be blood sweat and tears before the night is through, it's just a matter of when. When the next dawn broke over an even more battle scarred town this soldier was one of a pitiful few live Soviet troops that pulled out of town. They had held the line. 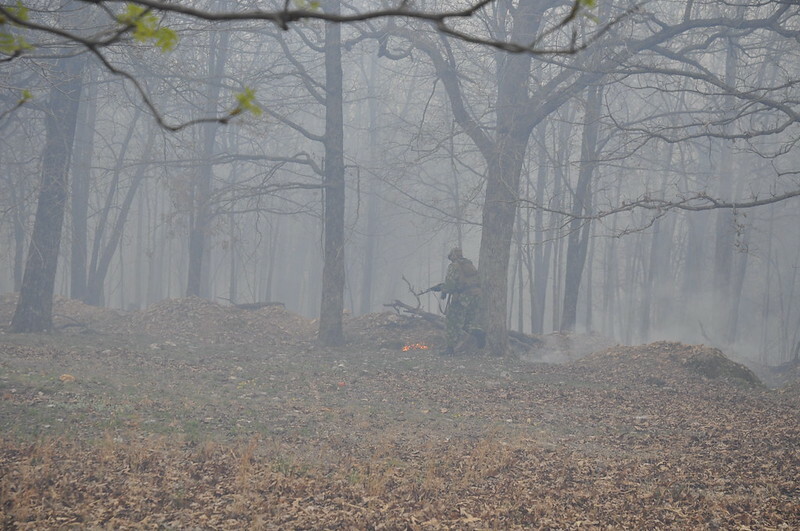 A Soviet Soldier during the last battle of East Wind 5 races along the edge of a burning forest to get himself into an assault position for the final push. The final battle was set in the closing stages of a large scale nuclear exchange so we worked with the local volunteer fire department to do a controlled burn of the site the same day. The effect was staggering. A US Army soldier at a OP prior to the beginning of hostilities takes notes on the activities of the East German border guards posted on the opposite side of the border from him. Do they have any routines? How often are they fed? Do they have a supply cache nearby? Are they avoiding any particular areas on their side of the border? What are they using to communicate with higher? Do they appear to be well organised? How does their morale look? Less than 24 hours later anyone who did not know why this sort of thing matters probably wasn't alive to know it. East German Grenstruppen, growing progressively more bold and provocative walk literally right up to the border and examine NATO positions with binoculars. 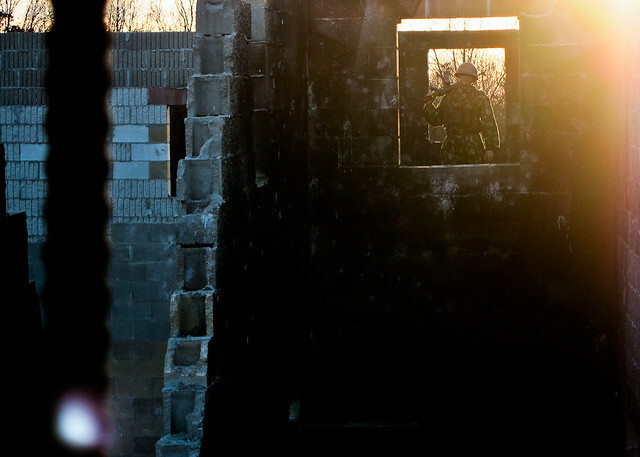 A Canadian Forces trooper moves up opposite of them just outside the concertina wire on the NATO side of the border zone matching them move for move. The rest of his section is positioned, watching and waiting. As the afternoon wore on, tensions continued to rise until a NATO officer who had grown a little too accustomed to walking up to the border and yelling at the East Germans took a 7.62 round to the chest. 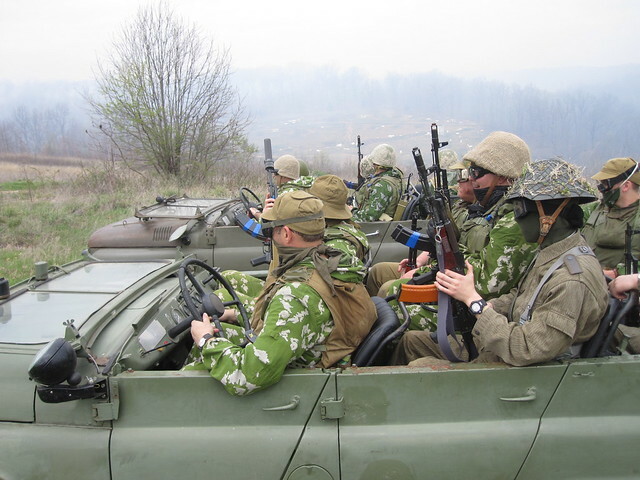 Moments later, the two border guards seen here were riddled with 5.56 and the Soviet troops who were driving up to the border in their APC to show the flag suddenly had an entirely different mission. 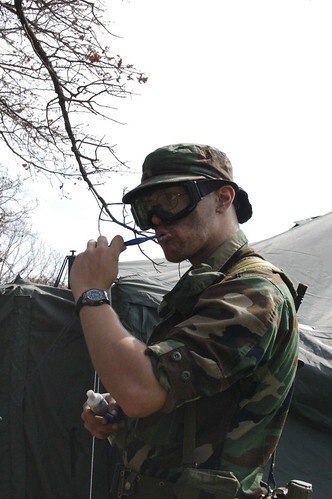 A US soldier takes a moment to brush his teeth after a mission. You're out there for 9 days... That means eating, sleeping, pooping, washing and shaving in a combat environment. Canadian Forces patrol members on a night patrol. 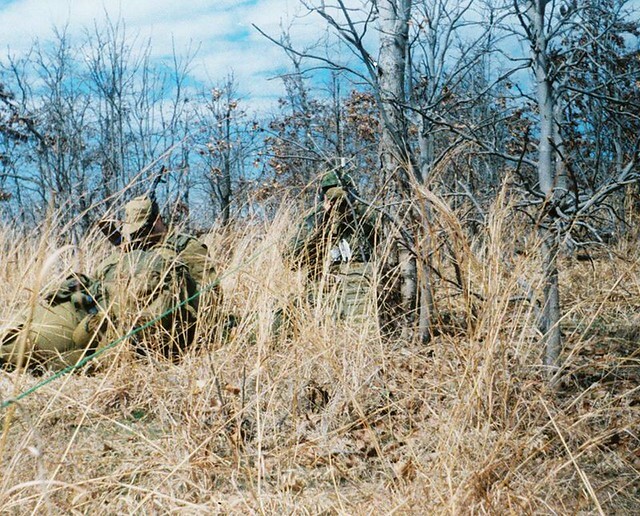 The far trooper has a correct Canadian Forces issued PVS-502 mounted to his C7A1 rifle, while the trooper in the foreground just has the Elcan daylight optic on his. 50% of East Wind happens at night so you soon grow used to trying to pick out what the blurry images in your night vision are. 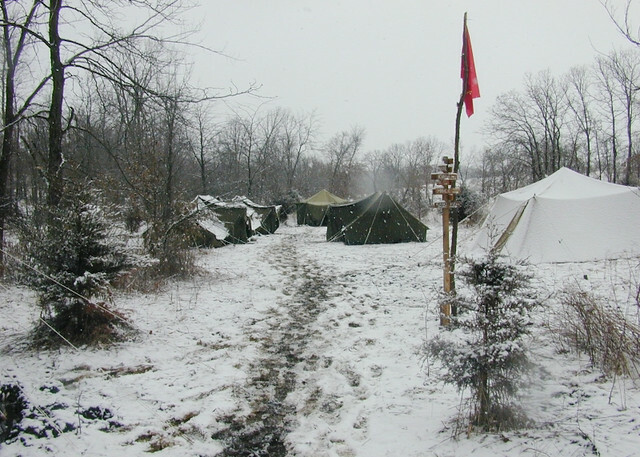 Warpac Camp at East Wind I. A lot has changed in the time since we began working on East Wind now nearly a decade ago. 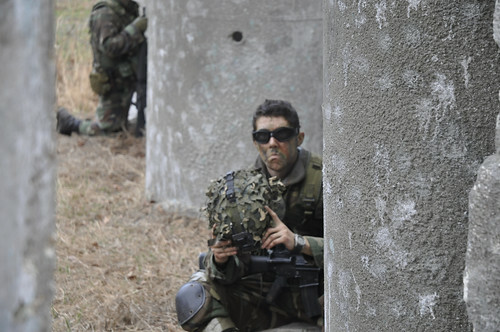 The sport of airsoft has a broader base but in many ways lacks the same focus it used to have in years long past. On top of all of that, none of us are the spring chickens we were a decade ago so things eventually reach a point where they must change. We are at that point now. East Wind 8 will be the last East Wind. While we have been successful and we have always met goal for both quantity and quality of attendees, we feel that the writing is on the wall and we are better to end this chapter in our lives on a high note rather than continue down a path we do not believe will sustain the quality we expect from this event that to so many of us has been a singular obsession for so much of our lives. Things change, people change, memories are forever. Come on out and join us for one last hurrah.